The kit consists of one yoke, one flange for the differential, and one drive shaft 1310 half ton or a 1350 one ton high angle drive shaft. A 1350 CV style yoke will replace the factory flange yoke at the transfer case. The choice 1310 and 1350 depends on the lift and the articulation of the vehicle. For strength the 1350 can be used in any case. 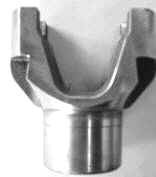 An input flange four bolt is provided to replace the pinion flange six bolt. All drive shafts come with high angle 35 degrees on 1350 series to prevent binding when articulating. To get it right on measure from in front of the six holes of one flange to the same spot of the other and do the rest. Above is the typical kit for the front or rear drive shaft and supporting flanges and yoke with long travel option. The long travel are necessary on on high articulation vehicles or highly lifted vehicles. You will have two heavy duty 1350 drive shafts that attach to heavy duty flanges and one ton CV style yokes.